Often, early childhood educators can forget the developmental levels at which children develop certain behaviors and can perceive developmentally appropriate behaviors as a problem. Early childhood classrooms can sometimes feel like a hive of activity, with children moving in several different directions at once, small arguments breaking out in every corner and seemingly inappropriate behavior everywhere you look. Take a good, hard look at your classroom. Have you set your expectations too high when it comes to what kinds of behaviors are appropriate for your class? Have you set up your environment to meet the developmental needs of the children in your care? Look closely at your lesson plans and daily schedule. Do you have a good mix of indoor and outdoor activities? A balance of small and large group activities? Are children expected to sit still or be quiet through several blocks or time? Maybe the behavior you have been struggling with is actually a normal part of early childhood develoopment. Often, adjusting your perception of what is appropriate and what is not can help you better understand and manage your daily classroom plan. The following are some of the behaviors that can provide a challenge to many early childhood educators. Strategies to help you adjust your expectations and teach through these behaviors are included, also. Attention Span: A child's attention span is usually somewhere in the vicinity of three to five minutes per year of child's age. This means that a group of four year olds have an average attention span of twelve to twenty minutes. Therefore, planning long circle time activities where children must quietly sit still for an extended amount of time will probably warrant some unwanted behaviors. Adjust your lesson plan and daily schedule to reflect your class' appropriate attention span. Circle time should not last more than twenty minutes at the most for a preschool class. Be sure to plan several activities for your large group activities, but do not expect to get to all of them. If one activity fails to keep the children's attention, it may be time to abandon it in favor of another activity. Take your cues from your class. A Balance of Activities: Take a good look at your daily schedule. Do you have several "sit still" activities scheduled one after the other? 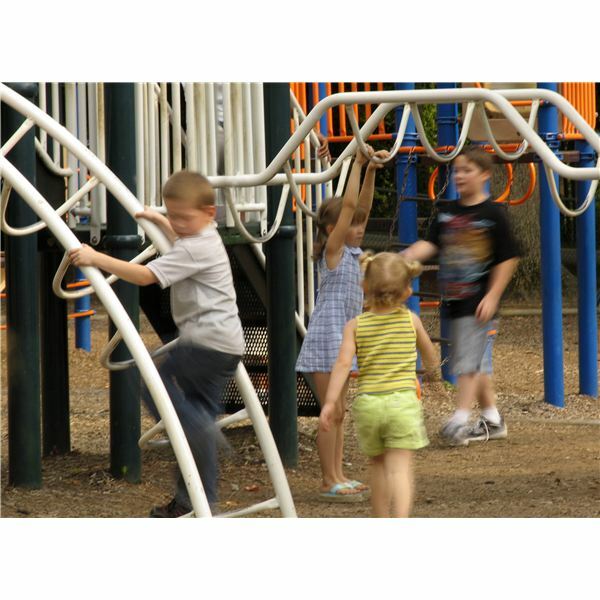 Is your outdoor play time immediately before nap or rest time? Are children expected to function as a large group several times a day? If you answered yes to any of these questions, it may be time to change your schedule a bit. Children need a balance of large and small group activities each day, as well as a balance of indoor and outdoor activities. If you have planned several quiet large group activities in a row, children may become restless and need a chance to move their bodies. Very young children function much better in a small group or individually than they do in a large group. Too many large group activities may create arguments between children, and you will spend a good amount of your day putting out small fires rather than guiding and teaching. Self Expression: Very young children often lack the vocabulary to tell others what they are thinking and feeling. Sometimes, children will bite or hit another child out of frustration or anger. Hitting and biting are ways children use to express themselves before they are mature enough to find and use the proper vocabulary. You can ease these difficult situations by helping children find appropriate words for their frustration. This will involve getting on the child's level and giving them the appropriate words to use. For example, you can say to a small child who is angry at another child, "Grace tell Emily, 'I am angry, Emily. I would like that toy and you took it from me. That makes me mad.'" This practice will get children in the habit of using words rather than hitting or biting to show their emotions. Sharing: According to child development experts, most children should not be expected to share effectively until elementary school! While it is certainly important to help children learn what sharing is and how to share fairly, most children will not be able to do it on their own without adult supervision until the age of eight. Children are egocentric in early childhood and sharing does not come naturally to them. Gentle reminders to share can help, but it is important to also get down on a child's level and show them what you expect when you ask them to share. The next time you find yourself wondering why you have so many behavior issues in your classroom, remember that many seemingly problem behaviors are just a normal part of child development. The most important technique a teacher can use is patience! Many of these issues your students will soon grow out of. This series includes a how to article outlining strategies to manage disruptive preschoolers as well as an article discussing normal preschool behavior that may be percieved as negative or inappropriate.